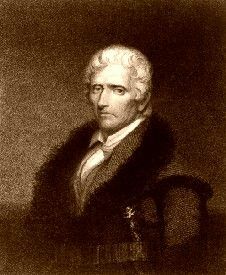 Daniel Boone (1734-1820) – In the mid 1700’s the English colonists lived almost entirely between the Alleghany Mountains and the Atlantic Ocean. This continued to be their narrow boundaries up to the beginning of the American Revolution. However, by the end of the war, the western boundary extended to the Mississippi River and a number of pioneers and backwoodsmen began to move westward. One of the most noted of these pioneers was Daniel Boone. He was born in Berks County, Pennsylvania on November 2, 1734, the sixth of eleven children in a family of Quakers. Caring little for books as a child, he spent most of his time hunting and fishing. He loved the woods and soon became an expert rifleman. An early story tells of when he was just a young boy he wandered one day into the forest some distance from home, where he built himself a rough shelter of logs. There, he would spend days at a time with only his rifle and game for company. This free, wild life trained him for his future career as a fearless hunter and woodsman. When Daniel was about 13, he moved with his family to North Carolina and settled on the Yadkin River. As a young man, he served with the British military during the French and Indian War (1754–1763), a struggle for control of the land beyond the Appalachian Mountains. In 1755, he was working as a wagon driver in General Edward Braddock’s attempt to drive the French out of the Ohio Country, which ended the Braddock expedition at what is known as the Battle of the Monongahela. Boone returned home after the defeat, and on August 14, 1756, married Rebecca Bryan, a neighbor in the Yadkin Valley. The couple initially lived in a cabin on his father’s farm before building a small cabin in the wilderness, far removed from other settlers’ homes. The couple would eventually have ten children. In 1759, a conflict erupted between European colonists and the Cherokee Indians, their former allies in the French and Indian War. After the Yadkin Valley was raided by the Cherokee, many families, including the Boones, fled to Culpepper County, Virginia. Boone served in the North Carolina militia during this “Cherokee Uprising”, and his hunting expeditions deep into Cherokee territory beyond the Blue Ridge Mountains separated him from his wife for about two years. During this time, Boone began exploring the territory to the west pushing his way as far as Boone’s Creek, a branch of the Watauga River in Eastern Tennessee. Near this creek there yet stands a beech-tree with the inscription: “D. Boon Cilled a Bar [killed a bear] on [this] tree in the year 1760”. On May 1, 1869, Boone, with five other men, started out to cross the Alleghany Mountains. For five weeks the bold travelers picked their way through the pathless woods. In June, they reached Kentucky; they were rewarded for all the hardships they had endured. For here was a beautiful country with an abundance of game, including deer, bears, and great herds of bison. Deciding to stay for a while, they promptly put up a log shelter. Six months after their arrival Boone and a man named Stewart had an unpleasant experience. While off on a hunting expedition, they were captured by an Indian party. For seven days the warriors carefully guarded their prisoners. But, on the seventh night, having gorged themselves with game killed during the day, the Indians fell into a sound sleep. Boone, while pretending to be asleep, had been watching this opportunity, quietly awoke Stewart, and the two crept stealthily away. Returning to their camp, they found it deserted what had become of their friends they never learned. Some weeks later Boone was pleasantly surprised by the appearance at the camp of his brother, Squire Boone, and a companion. The four men lived together without incident, until one day Stewart was surprised and shot by some Indians. Stewart’s death so terrified the man who had accompanied Squire Boone that he gave up the wilderness life and returned to his home. Boone and his brother remained together in the forest for three months longer, but with their ammunition getting low, Squire returned to North Carolina in May for fresh supplies and horses. Daniel was thus left alone, 500 miles from home. His life was in constant peril from wild beasts and Indians. He dared not sleep in his camp, but resorted at night to a cane-brake or some other hiding place, where he lay concealed, not even kindling a fire lest its light might betray him. During these months of solitary waiting for his brother, Boone endured many privations. He had neither salt, sugar, nor flour, his sole food being game brought down by his rifle. But, his brother returned in July bringing provisions. 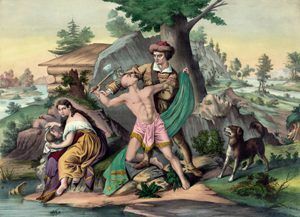 After two years of this experience in the wilderness, Daniel Boone returned to his home on the Yadkin River to make preparations to move. By September, 1773, he had sold his farm and was ready to go with his family to settle in Kentucky. His enthusiastic reports of the fertile country found eager listeners, and when his party was ready to go, it not only included his own family, but also five more families and 40 men, with a sufficient number of horses and cattle. Unfortunately, they were attacked on their way by Indians, and six men, one of them Boone’s eldest son, James, were killed. Discouraged by this setback the party returned to the nearest settlement and the migration westward was postponed. But, it was Boone’s unflinching purpose to settle in the beautiful Kentucky region. It had already become historic, for the Indians called it a “dark ground,” a “bloody ground,” and an old Indian Chief had related to Boone how many tribes had hunted and fought on its disputed territory. None of the Indians held an undisputed claim to the land. Nevertheless, a friend of Boone’s, Richard Henderson, and other white men made treaties with the powerful Cherokee, who allowed them to settle there. 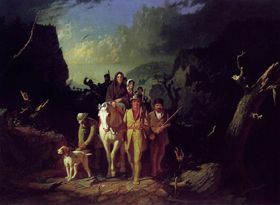 As soon as it became certain that the Cherokee would not interfere, Henderson sent Boone in charge of 30 men to open a pathway from the Holston River, over Cumberland Gap to the Kentucky River. This is still known as the Wilderness Road, along which thousands of settlers afterward made their way. On reaching the Kentucky River, Boone and his men built a fort on the left bank of the stream which they called Boonesborough. 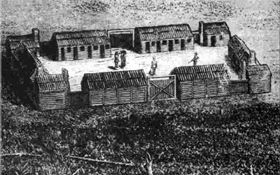 Its four stout walls consisted of the outer sides of log cabins and 12 foot high stockade. There were loop-holes in all the cabins, and a loop-holed block-house at each corner of the fort. Daniel Boone, the leader of this settlement, was a man of interesting personality. He was a tall, slender backwoodsman, with muscles of iron and a rugged nature that enabled him to endure great hardship. Quiet and serious, he possessed courage that never shrank in the face of danger. Men had confidence in him because he had confidence in himself. Moreover, his kind heart and tender sympathies won lasting friendships. He usually, though not always, dressed like an Indian. A fur cap, a fringed hunting shirt, leggings and moccasins, all made of skins of wild animals, made up his ordinary costume.